Thanksgiving approaches, we would again like to express our appreciation for our patients and their families. Thank you for trusting us with your medical, dental, and mental health care needs. We continue to be grateful for our staff of dedicated, hardworking, and caring employees. Thank you for helping serve our patients and community. 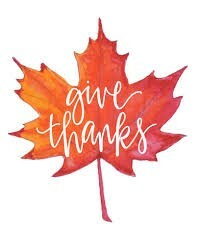 We also continue to be thankful for our Board of Directors, a group of dedicated individuals from the community, many of whom are patients of the clinic. Thank you for volunteering your time and energy to provide us with ongoing guidance and leadership. These benefits should make all of us want to try living a life of gratitude. We wish you a very happy and healthy Thanksgiving holiday.